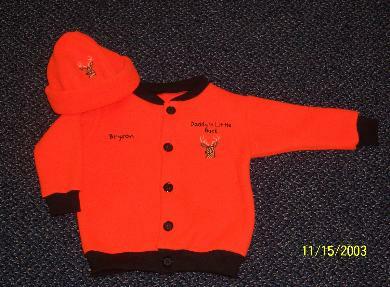 Order your camouflage or blaze orange shirts, jackets, and hats! Great to sell at your bar/restaurant with your logo or special saying embroidered on it. Call me and we can discuss your order. 6 mos, 9 mos, 12 mos, 18 mos, 2T, 3T, 4T. Only available in orange w/ black trim.